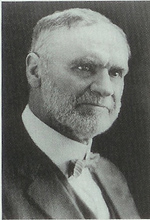 Orson Ferguson Whitney (1 July 1855 – 16 May 1931) born in Salt Lake City, Utah Territory, was a member of the Quorum of the Twelve Apostles of The Church of Jesus Christ of Latter-day Saints (Mormon Church) from April 9, 1906 until his death. Whitney was the son of Horace K. Whitney and Helen Mar Kimball. His mother Helen was married in secret to Joseph Smith, Jr., the first prophet of the Mormon Church, in May 1843, when she was 14 years old. After Smith's death in 1844, Helen Kimball "married for time" to Horace Whitney with Whitney serving as a proxy for the departed Smith. Whitney's father, Horace, had set type for the orginial publication of the Deseret News. Whitney was a politician, journalist, poet, historian and academic. As a young man, Whitney began a career in writing with the business office of the LDS newspaper, the Deseret News, later becoming a reporter and the city editor. During a mission in Europe for the LDS Church from 1881 to 1883, he acted as editor of the church publication Millennial Star. In 1896–1897, Whitney taught English and Theology at Brigham Young College, in Logan, Utah. In 1899, Whitney accepted the position of Assistant Church Historian and served in that position until he was called as an apostle. Whitney was also involved in the politics of Salt Lake City and Utah. He served on the Salt Lake City Council in 1880, acted as City Treasurer from 1884 to 1890, and served as a State Senator in 1898, and again in 1901. Whitney produced the lyrics to LDS Church hymns, including "The Wintry Day, Descending to Its Close", (music composed by Edward P. Kimball) and "Savior Redeemer of My Soul" (music by Harry A. Dean) appearing as hymns #37 and 112, respectively, in the 1985 edition of the LDS Church hymnal. His historical works, although detailed, well researched and presented, are written from a Mormon perspective and are generally considered ...locked in the ironclad orthodoxy... of Mormonism. In 1905, two members of the Quorum of the Twelve Apostles resigned over a dispute with church doctrine and policy. John W. Taylor disagreed with the manifesto forbidding plural marriage; Matthias F. Cowley felt that it should apply only to the United States. In February of the next year, Marriner W. Merrill died, leaving three vacancies in the quorum. At a general conference of the Church, Whitney was called on April 8, 1906, and ordained the following day, along with George F. Richards and David O. McKay. Orson F. Whitney is also recognized for his poetry. He also wrote a history of Utah. Whitney served missions in both Pennsylvania and Great Britain. During his mission to the latter place he was editor of the Millennial Star. He also served as a bishop in Salt Lake City for many years, first being called when he was still single. On the occasion of his calling the authority calling him read the passage from the New Testament on bishops being required to be married, emphasizing that Whitney should get married. He was married to Zina Beal Smoot in 1879. Whitney died in Salt Lake City after being hospitalized for influenza. This page was last edited on 28 December 2011, at 13:58.